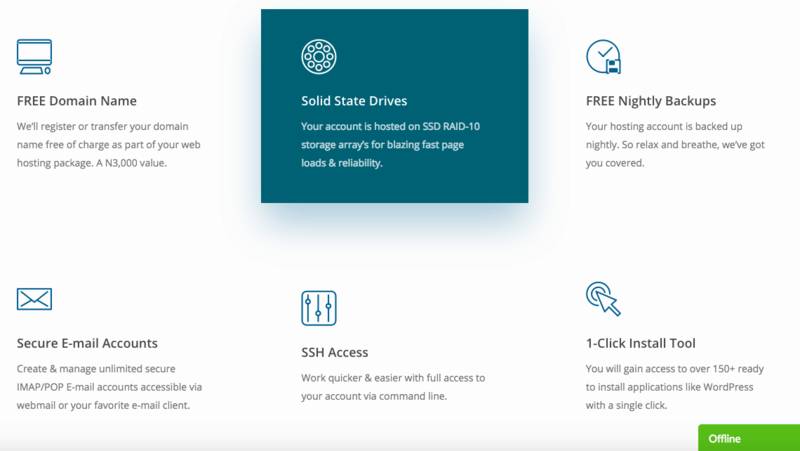 DexHost Review 2019: Is DexHost a Good Hosting? DexHost is a Nigerian hosting company selling a full suite of services with SSD. The uptime guarantee doesn’t appear to be backed by any credits, but the plans are surprisingly feature-packed. DexHost is a Nigeria-based website hosting provider and website development company. It claims to be a leading host in Nigeria, however, after researching online and reviewing the limited information about the company on the English website, I can’t find information to back that statement up. The plans all use Linux operating systems with fast SSD storage in RAID 10 configuration to mitigate data loss in the event of a disk failure. There is a 99.9% uptime guarantee, however, as far as I can tell from the terms and conditions, it’s not backed by any compensation. I’m impressed with the level of value added features for both beginners and experts. First, there’s a one-click installer with more than 150 programs and also a drag-and-drop website building tool. It’s easy for beginners to get started with minimal coding or technical experience. Second, as well as all of the usual expert level features e.g., support for PHP (only slow version 5), MySQL databases, and FTP accounts, there are some added extras. For instance, Python and Perl are supported and the shared hosting plans come with SSH access and Cron jobs. Finally, if SEO is important to you, all plans come with free tools to promote your website including a search engine submission tool and marketing package. The plans range from cheap (with no SSL included) to overly expensive, which is a little odd as aside from higher resources, the features are always the same. To be honest, the resource quotas are so high, most everyday website owners will be absolutely fine with the cheapest plan. All of the plans come with one free .com.ng domain, while the two most expensive plans also come with a free SSL certificate. In my opinion, you shouldn’t upgrade to get the SSL, the price point is too high. The plans can only be purchased in one, two, or three-year plans, but if that feels too risky, there’s a 30-day money-back guarantee to help you get started. Customer service is 24/7 by phone, live chat, and email, which is fortunate because (unless it’s hidden in the login client area), there’s only a tiny knowledge base to refer to. Further, live chat was offline when I visited the website at around 3:00 p.m. on a Wednesday. 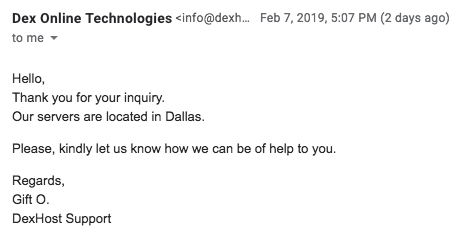 I sent an email instead and received a response within a few hours answering my question in full and in English. DexHost sells a full suite of services including dedicated servers and VPS. Considering the simplicity of the website, I was impressed by the level of features provided and it ticks most of the boxes for all kinds of users. Just be cautious as it appears the uptime guarantee is a bit gimmicky and the upper tier packages are overly expensive. Purchase hosting with advanced-level features from DexHost! Wondering how DexHost stacks up against other Web Hosting companies? Enter any other Web Hosting company and we will give you a side-by-side comparison.